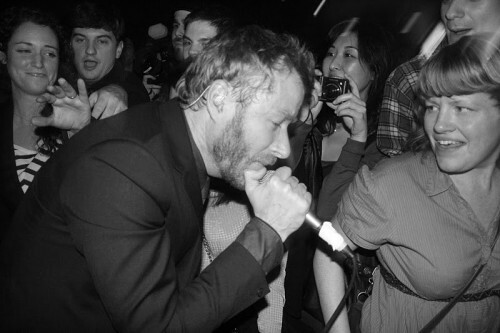 On March 7th, rumors spread that The National were announcing a last minute addition of two shows at Brooklyn’s Bell House, a tiny venue with a capacity of 350 in the concert hall for Thursday March 11th and Friday March 12th. Discosalt friend Backseatsandbar was there to fill you in on what you missed. As you would imagine once the rumors were confirmed true, tickets sold out in ten minutes for both nights. The intimacy of the small venues was particularly exciting knowing that the band has already sold out Radio City Music Hall for their performance next month. Ethan Lipton’s band provided the twisted yet hilarious opening band for Thursday’s performance. 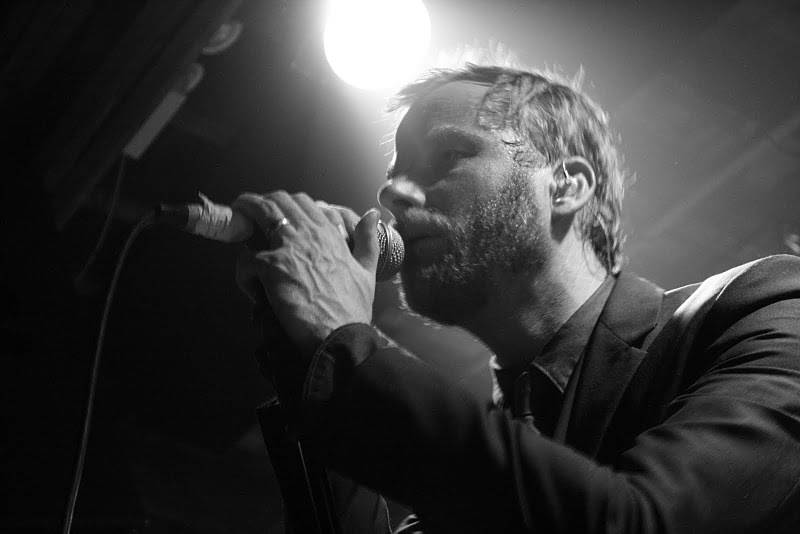 The National had debuted the opening track from their new album High Violet (May 11 on 4AD) on Jimmy Fallon on Wednesday night (video) which set the stage for what The Bell House performances would bring. Playing to a packed house, we were privileged to hear 10 songs not from any of the albums, thus presumably all on “High Violet.” In form with everything the National have every put together, all of the tracks were really wonderful, but too many new ones for me to give substantive commentary. Bryce thanked the crowd and confessed that tonight was the first night that many of these songs were being performed live and though I’d never heard 10 of them live, several have been played in the past. Often when bands I know play songs I’m not familiar with, it can be off-putting, but hearing these songs just heightened my anticipation for the release of High Violet. Apparently the band has gotten so deep into the new album that some of the old songs seem like distant memories, as Matt laughed at himself when he couldn’t remember how to begin Start a War, needing the audience to get him started, reminding me of Dylan’s 1964 performance of I Don’t Believe You (She Acts Like We Never Have Met). Matt also opened up a little on some of his earlier songs, mentioning that his wife Carin Besser co-wrote two of my favorite songs from Boxer, namely Slow Show and Apartment Story; two songs that I really think makes The National one of the best story-teller bands. Matt and crew looked as professional as ever, and Matt thought ahead to bring a bucket of ice for his bottle of wine that he so frequently keeps with him on stage (though he seemed to drink considerably less). He eventually passed the bottle of wine into the crowd and the crowd loved him for it. Always one to interact with the crowd, and always during Mr. November, Matt launched off the stage, grabbed my girlfriend Lily’s arm and pulled her to the middle of the room and sang to her (above), making every other girl in the room instantly jealous. As Matt likes to sing a little too close to the edge of the stage, he nearly pulled a Jim James, but fortunately my head was there for him to keep his balance (which isn’t the first time I’ve helped him get on stage). Matt is unequivocally one of the best frontman I have ever seen and his energy and enthusiasm creates the perfect mood amongst the crowd for watching a concert. That said, it can be funny to see the nervous ticks we saw at our first opportunity to see the National back in March 2007 are still there such as the way Matt doesn’t quite know what to do with his hands so he pats his chest and tucks his left hand into his right armpit, but he is doing it noticeably less. This time, Bryce even noted it to the crowd, saying that when Matt moves around a lot on stage it’s because he’s nervous. How the frontman of a band who can command the love and respect of an audience like the National does can still be nervous is amazing. The National once again put on an incredible show and blew the minds of everyone who was lucky enough to be there to witness it. The opening band, Ethan Lipton & his Orchestra, is hard to describe and unfortunately for those going to tonight’s show, you’re missing out. With songs like “Girl at the Renaissance Fair,” “Thrift Store Blues,” “I Like your Thighs,” and the somewhat creepy Whitney Houston, Ethan and his band kept the audience laughing out loud throughout his set. Donning houndstooth pants and mixing his patterns as best as Beacon’s Closet would allow and sporting a ridiculous mustache, Ethan put on a fantastic show and as Matt Berninger appears on Ethan’s latest album, Matt helped to close the set.